FlowJo, SeqGeq, and FlowJo Envoy subscriptions. Can multiple people share one FlowJo Portal account? No, a FlowJo Portal account is for an individual user. Personal licenses may not be shared with other users. It is intended for personal use only. Do you offer Dongle trade-in credit? If so, what is the Dongle trade-in credit? We do offer dongle trade-in credit that requires that you return or destroy your dongle upon switching to an annual subscription license. Two FlowJo annual subscriptions per dongle if your Dongle was purchased from 2016-present. $500 (academic) / $750 (commercial) credit if your v10 Dongle is 2+ years old. $250 credit if your Dongle is a version 7/8 dongle and does not allow access to v10. What is the price of an annual subscription for FlowJo, SeqGeq, or FlowJo Envoy? To receive a quote for your region and institution type, please contact office@flowjo.com or fill out the quote request form. We highly recommend using Google Chrome. Does it matter if you use PC or Mac? No, but you will need to confirm that your computer meets the requirements (FlowJo, SeqGeq) to run the solution you’re pursuing. Do you offer any discounts if we buy more than one license at the same time? Yes, we offer bulk discounts and group licensing options. Please contact office@flowjo.com or call 800-366-6045 for more information. 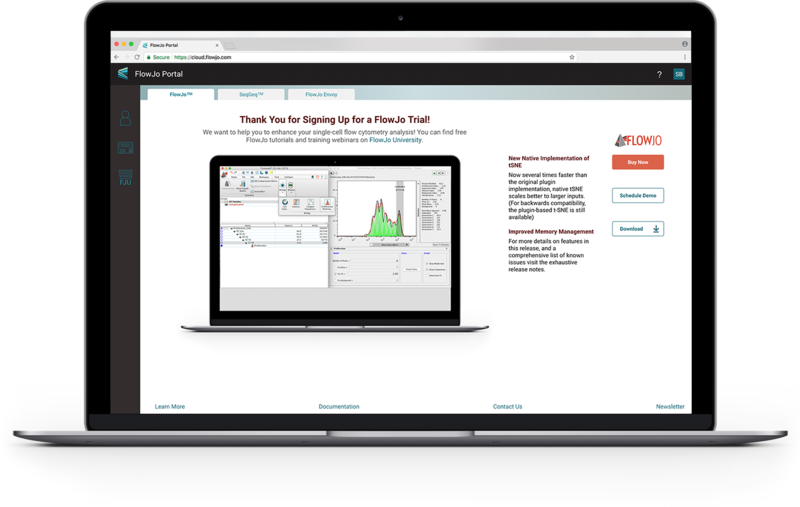 Yes, please visit the product pages of FlowJo, SeqGeq, and FlowJo Envoy to get a free trial. Will I have immediate access when I purchase a license through the FlowJo Portal? Once you have a FlowJo Portal account, you can download your purchased solution and sign in using your FlowJo Portal ID right away.